We eat a lot of greens in our house. Well, they ARE just outside the door, after all. We don’t eat them every day, but when we do we are serious about it and I build the meal around them. 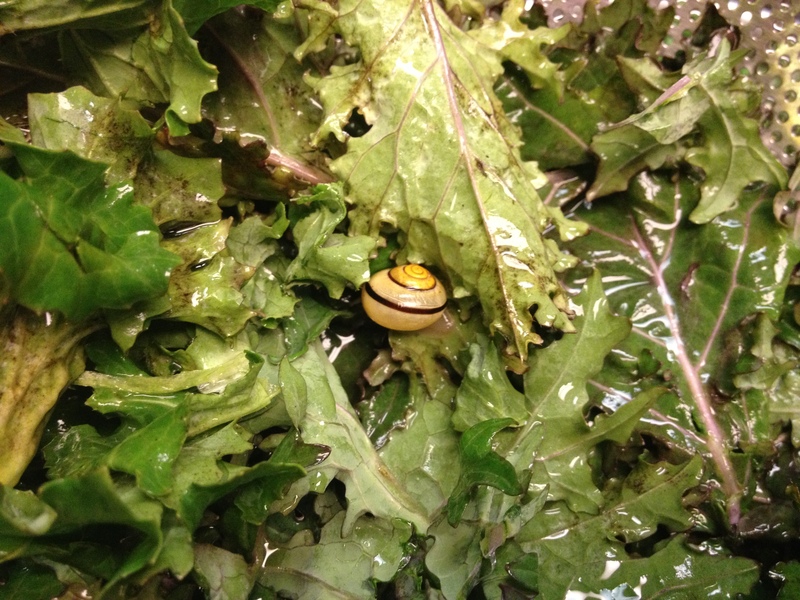 We typically eat three of our bunches of kale in one meal. And generally I sauté all greens, except salad-type things. Here’s how. 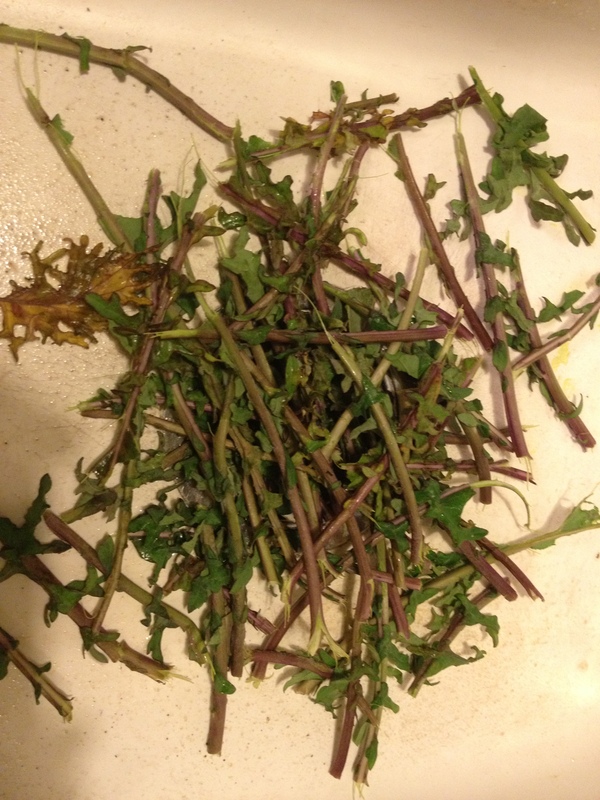 A bunch of kale with the rubber band removed. Take out any leaves that are yellowish. Kale leaf, stripped of it’s thick stem. If your leaves are much bigger than this, chop them coarsely or slice into ribbons. Then put them into a colander and rinse them. Leave a bit of water on them, you don’t want them totally dry or they’ll burn in the pan. 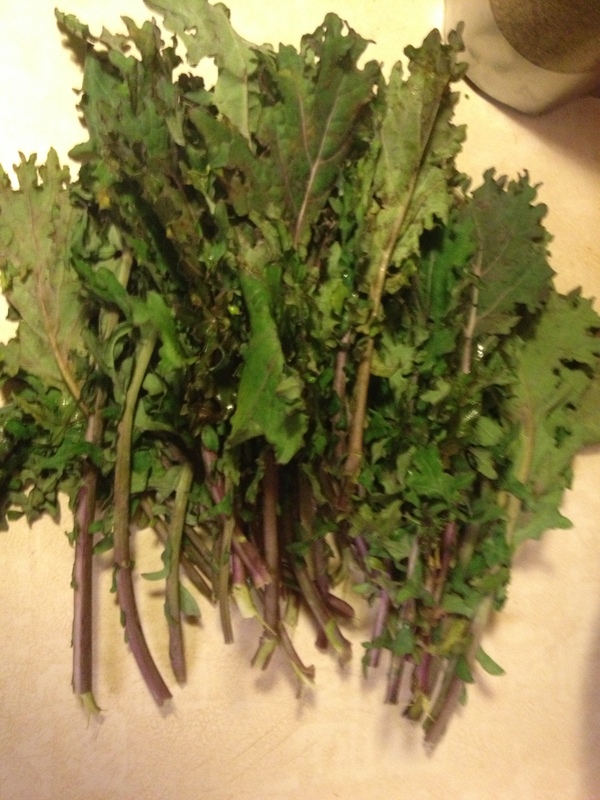 Stems stripped off of the kale leaves. You only need to remove the thickest parts of the stems. Check for critters. Sometimes we don’t catch them all. It just means the greens taste good, and everyone wants some of the action. Better to find it before you cook, I think. I don’t like finding part of a critter on my plate. Just take it out—no biggie. 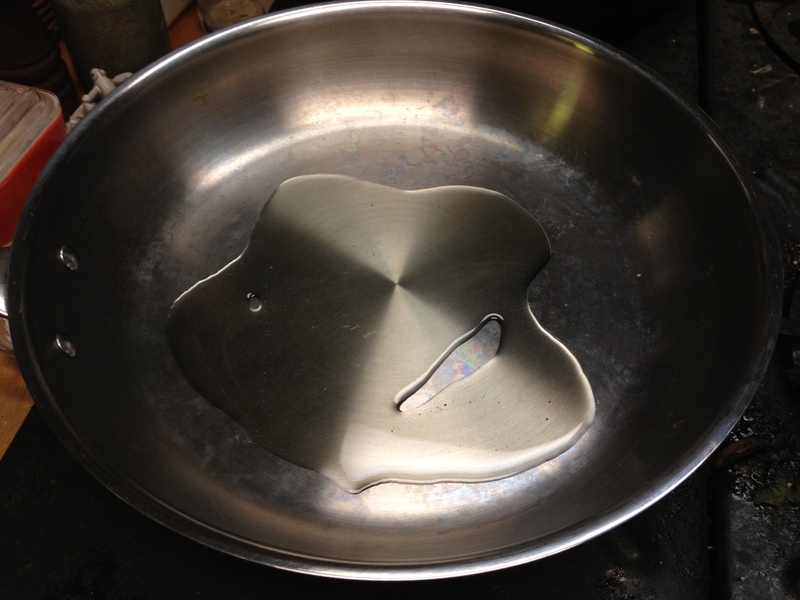 Put enough olive oil (or coconut oil, or whatever you prefer) in the sauté pan. I’m cooking three bunches of kale, so I need the oil to cover the bottom of the pan or I’ll just need to add more later. The amount you need is something you figure out as you go. You can always add a little more if there’s not enough. A long, long time ago I watched Julia Child on channel 9 with my mom. There was one episode, where she was cooking with Jacques Pepin. She called him a Garlic Freak. I don’t remember what he called her. He had a great technique for prepping garlic. 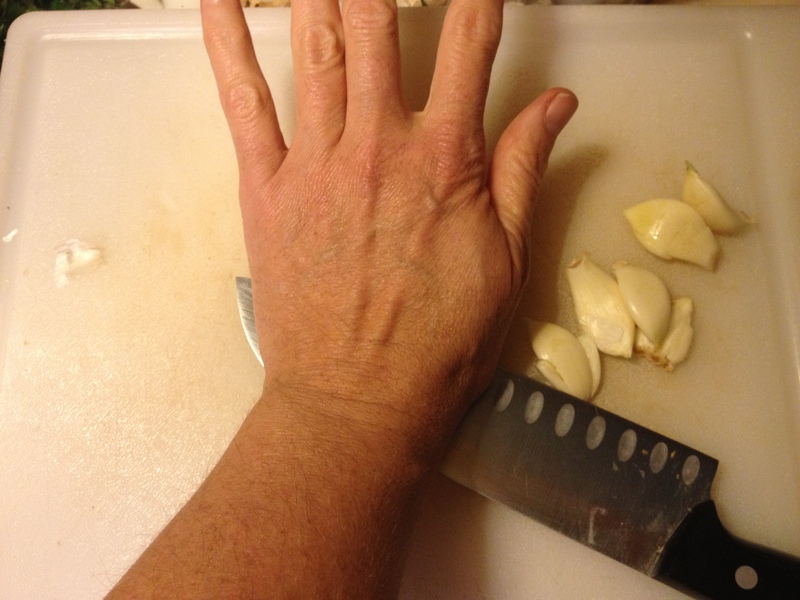 Break apart the cloves and smash them on the cutting board with the flat side of your big knife. Put the knife on top and bang it down with your palm. Smash/slide the garlic and the skin just pulls away. Then mince or slice it as you wish. If YOU are a Garlic Freak like I am, this is a great way to get a lot of garlic prepped at one time. I use just about a full bulb of garlic to cook my three bunches of kale. I chop up the garlic once it’s peeled and add it to the hot oil in the pan (about medium-high heat). Stir it around until you can really smell the garlic, but don’t let it burn. 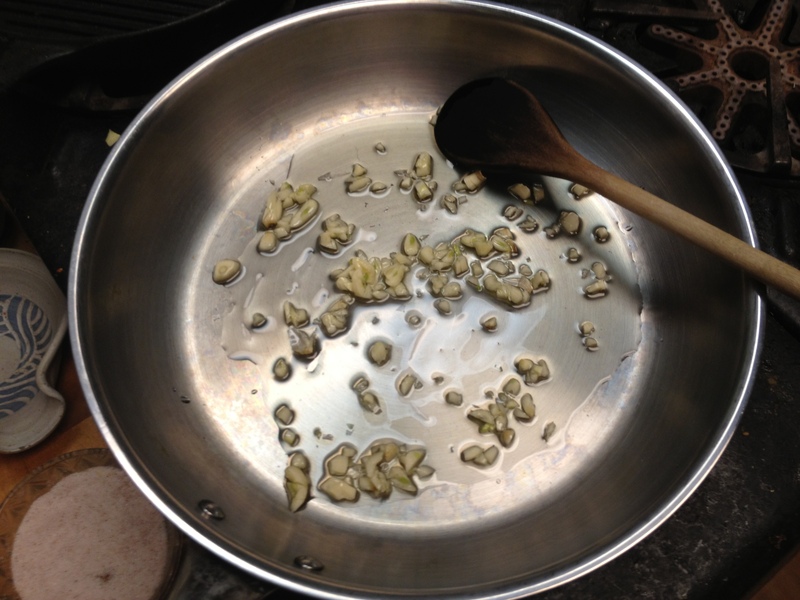 Once the garlic releases its aroma, add some of the leaves to the oil. Not too much—I added about one-third of my leaves at first. Then stir them around in the oil and let them cook down a bit. As the leaves cook down, add another bunch and stir them in. I find it easier to use two tools. I like wooden spoons. It’s easier to pick up and flip the leaves over without tossing them out of the pan. The pan will get pretty full quickly. Once all the leaves have cooked down, add a little salt and pepper to taste. Sometimes I add a dash of good vinegar to the greens after they’ve cooked, other times I just let them be and we add balsamic vinegar at the table. The kids are especially fond of the dark, thick “syrup”. Beautiful! This is exactly what we do and luckily my girls love it, and will hopefully inherit the garlic freak tendencies! 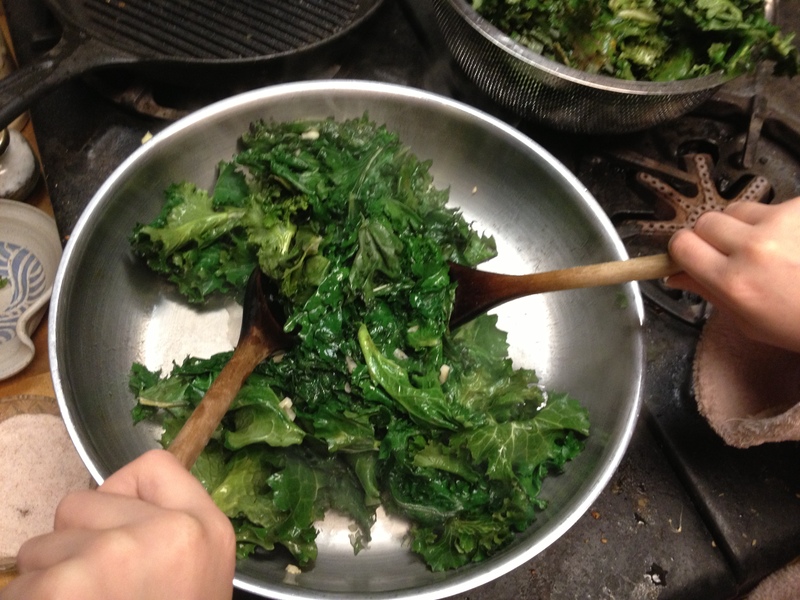 My kids love kale prepared this way…. 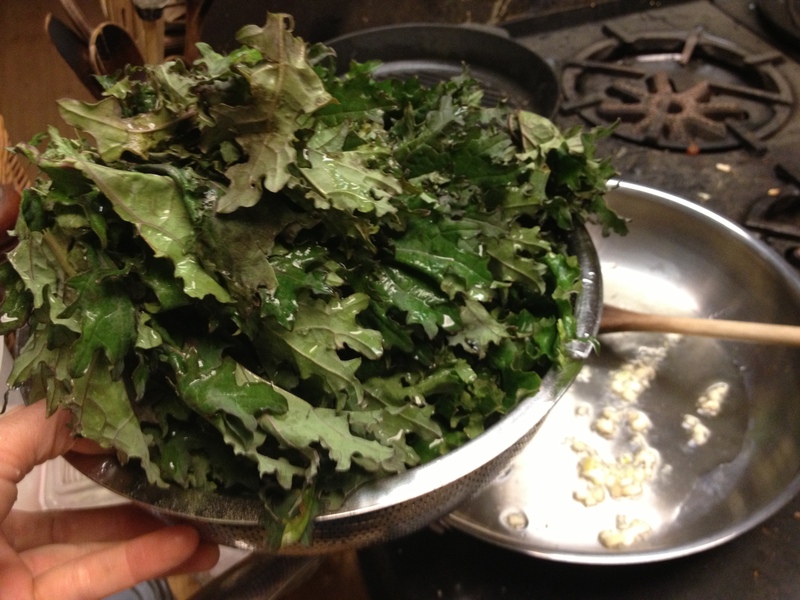 but wanted to try something new, so we tried making kale chips and it was a BIG SUCCESS! Preheat oven to 250. 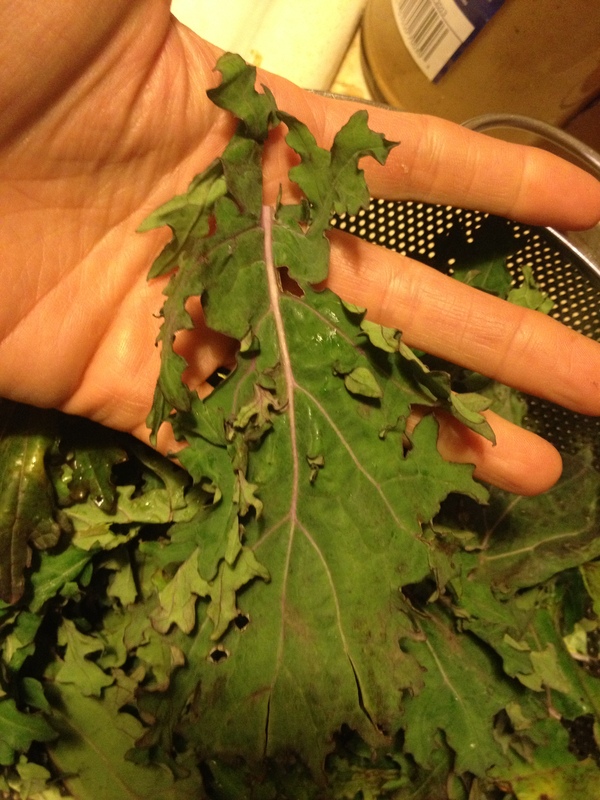 Prepare kale as above by washing and stripping the thick stem. Toss raw leaves in a little olive oil to coat.and add salt and pepper. Lay individual leaves out on a cookie sheet and roast for 20-30 minutes. Remove from oven, cool and serve. Delicious! Super easy to pack these in lunches. 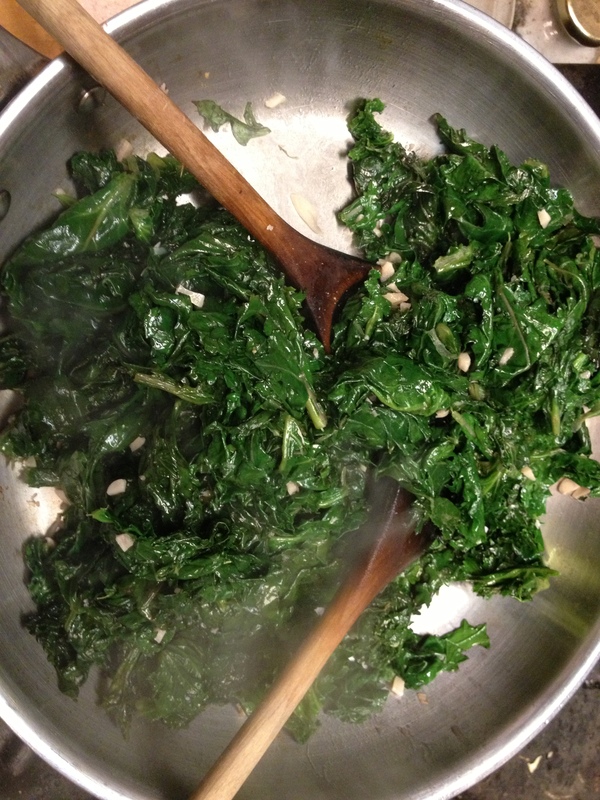 4 kids in the house put away 3 bunches of kale cooked this way in less than 10 minutes.